Yupo Paper. 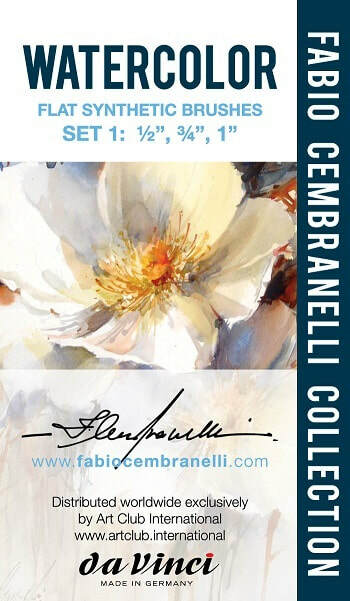 10 White Sheets 9" x 12"
Watercolor Set 1: flat synthetic brushes. Sizes 1/2", 3/4" an 1". Watercolor Set 2: round synthetic brushes. Sizes 10, 16 an #6 rigger. Finest golden synthetic and extra smooth light brown synthetic fibre, blue transparent lacquered hexagonal handles. We collaborated with DaVinci one of the top artist brushes producers in the world to create perfect sets of flat and round watercolor brushes. After several months of development we created a unique collection of tools to paint in Fabio Cembranelli loose watercolor style. Professional artist quality. Sold exclusively online. ​Shipping rate applies to individual orders of one bundle sale. International orders are shipped by Canada Post Air with a tracking number. For group orders contact us for your shipping rate. USA shipping - USD 16. International shipping - USD 35. Canada shipping - USD 16. Disclosure: This page may contain affiliate links. We receive a small commission at no cost to you when you make a purchase using our links.